Sautéed Bananas on Pain Perdu | What Smells So Good? 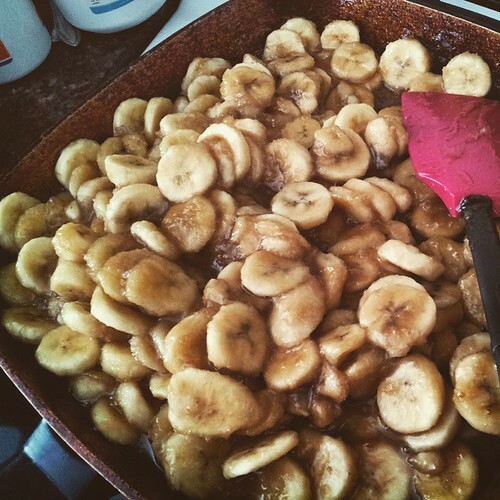 *Adults - add a splash of bourbon or rum to the bananas when they finish cooking for extra decadence! When butter begins to bubble, sprinkle in the sugar and cook 2 minutes, without stirring. Add the bananas and cook, stirring gently to avoid burning, for 2-3 minutes – until tender and caramelized but still holding their shape. Place bread slices on a baking sheet and bake for 4 minutes per side, until dry but not coloured. Set aside. Whisk together the eggs, milk, vanilla, vanilla custard powder, sugar, nutmeg, cinnamon and salt in a large casserole dish. Set aside. Place 2 slices of bread in the egg mixture and let soak in the egg mixture for 30 seconds - 1 minute per side. The bread should feel heavy but not fall apart. Spray the skillet with cooking spray and add the soaked bread. Cook until the outside is golden brown and crisp and the inside is cooked through, about 4 to 5 minutes per side. When the French toast in the pan is almost done cooking, soak the next two slices in the egg mixture. Move the cooked slices to a plate, slice in half on the diagonal and top with the bananas.